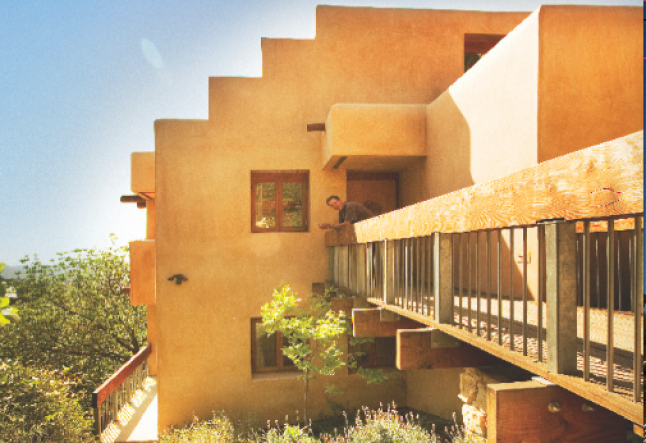 High up on a curve in the road crowning Mount Washington, the Santa Fe-style home of Gloria and Jerry Schneider perches like a peaceful bird chiseled out of sandstone. It overlooks a panoramic view of the Pacific, which is, on some days, so clear you can count the ships on the horizon and, on others, snuggled comfortably beneath an afghan of cloud. 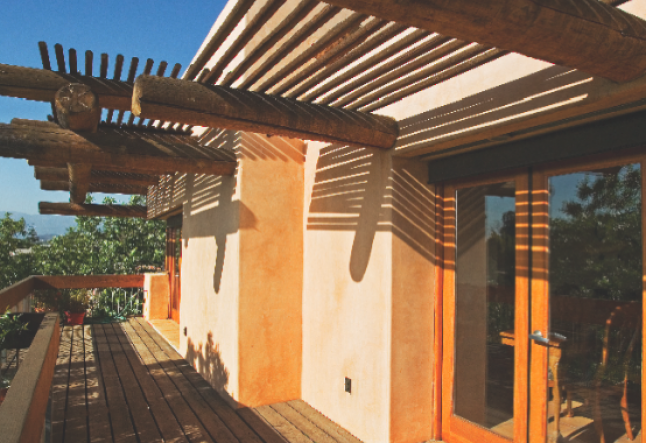 While the home hosts a long list of sustainable features, the environmentalism it houses is far greater than the sum of its parts: It’s a lifestyle. Jerry, a retired Los Angeles Department of Water & Power civil engineer and recent graduate of Cal Poly Pomona’s landscape architecture program, and his wife Gloria, who also worked for LADWP, practice an environmental philosophy of living in harmony with nature and being actively involved in it. “I don’t know if you know this,” Gloria says, “but we built this house with our own hands.” Everything about their home, from first conception to their daily lifestyle, requires actively engaging the intellect rather than what Jerry describes as a “set-it-and-forget-it” mentality. “Our house has no air conditioning,” Jerry says. He explains that the house is configured by geometry to function in an environmentally advantageous way. The passive solar design in the solarium breakfast area includes south-facing windows for winter warming with an overhang for summer shading, and west-facing windows equipped with roll-down screens for late afternoon sun; they’ve installed dual-glazed windows and positive weather seals around all of the doors and windows; the kitchen also has high-thermal, mass Sautillo tile floors that absorb the warmth from winter sun and the coolness of summer nights, and a charming, rustic kitchen table with wheels that can easily be moved in or out of the sun’s path. This awareness of the seasons and of the time of day inspires a lifestyle that is directly connected to nature. For example, on the outer windowsill of a west window that looks out onto the second-story deck, they brew sun tea. On a warm day, the tea is warm, and vice versa. 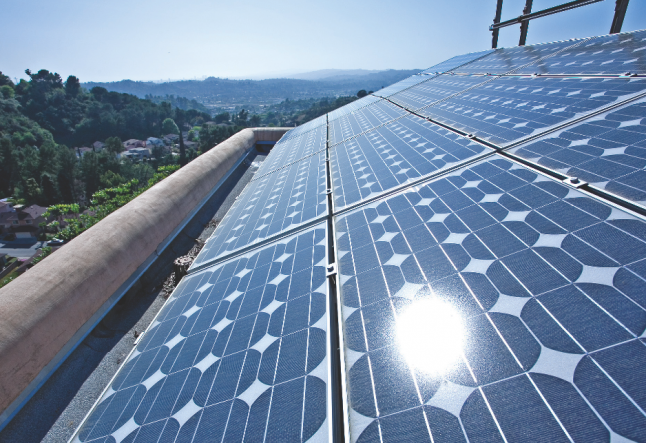 A 1-kilowatt solar photovoltaic system collects solar energy on the roof and is connected to the LADWP grid with net metering. So while the Schneiders do use some electricity—for instance, to charge their electric car—their meter moves both forward and backward, putting energy back onto the grid as well. Other eco-features include solar hot water collectors mounted on the roof that provide preheated water to the domestic hot water heater; high-efficiency lighting and appliances; thermostatically controlled pumps which provide instant hot water at water faucets furthest from the hot water heater; and an efficient attic ventilation system with added insulation. Guests are also quick to notice how quiet it is in the home, which has no fans, and feel how even the temperature is. 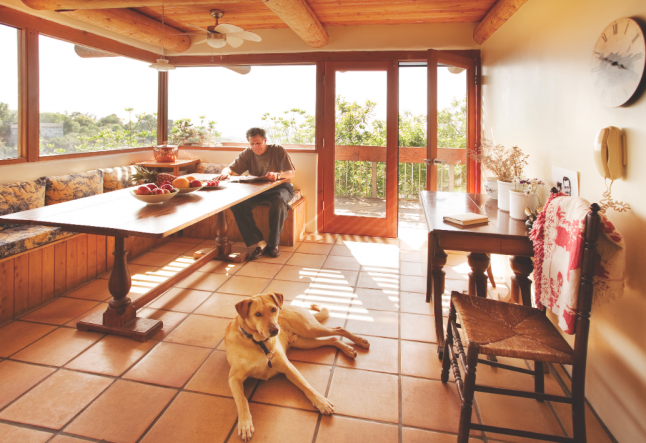 The home is cooled by convection: raised ceilings allow warm air to rise above inhabited spaces; outside air is drawn in at lower levels and escapes through transform windows set near high ceilings; the central stairwell acts as a convection chimney; and windows are balanced between windward and leeward to invite passing breezes. In addition, radiant heating is circulated throughout via hot water distribution pipes in the floors. The home satisfies what Jerry describes as the dual human desires of prospect and refuge. Prospect is the feeling you get when you’re in an open space with a lot of light and views. Refuge is a darker, more enclosed, comfortable space. For instance, on the ground floor the kitchen and living room are prospect spaces while the den is refuge. 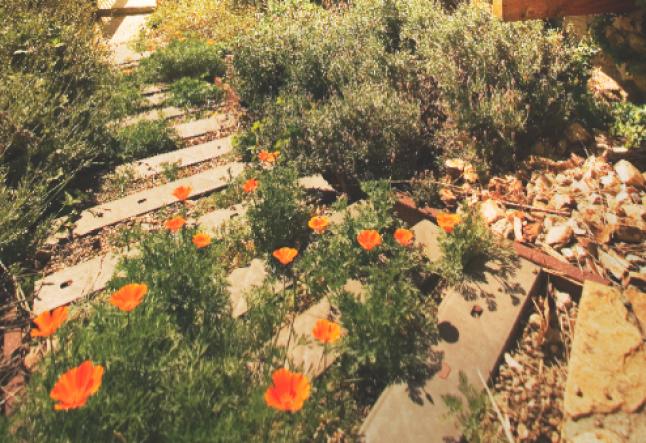 Behind the home on the downward-sloping lot is a native garden that is both an extension of the house and an extension of the Schneiders’ environmental philosophy. The garden, like the house, is designed to be harmonious with and actively involved in nature. It is irrigated by rainwater, which—instead of being routed off into city storm drains—returns to the earth through the permeable concrete driveway and gravel pathway in the front. Runoff from the front and from the roof is dispersed through a custom-designed retaining wall and gravel walk; supplemental irrigation is by a drip system. But despite being “native” and sustainable, the garden is by no means self-maintaining. Jerry carries their daily compost in a canary yellow metal bucket down the outside stairs to the worm bin, lifts the bin’s heavy wood flap and uses a shovel to mix it in. As a hobby, he cultivates baby black walnut trees and other native plants from seed, and he has salvaged, planted and tends to a garden of over 20 fruit trees and dozens of native species. Jerry and Gloria also collect coffee grinds from the local doughnut shop to use as mulch. “We didn’t eat the doughnuts,” Jerry jokes. To keep in compliance with brush clearing regulations, Jerry’s been busy trimming several trees. On the other side of the fence, a neighbor sprays pesticides. “The chemical way is the cheap and easy way for that guy,” Jerry quips. He explains that his native garden is a certified natural habitat. “I don’t know if people can relate to landscaping for wildlife,” he says. He sees a deeper purpose than that of gardening for beautification, and with that purpose in mind he makes a connection that visiting birds are sure to appreciate. As a final note, Jerry advises not to wait for coming legislation on global warming or green building; instead, act with your conscience and get peace of mind now and economic rewards in the long run. Jolia Sidona Allen is a freelance writer and college professor rooted in Santa Monica.